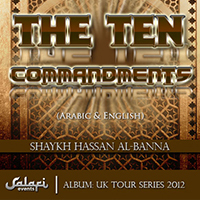 The Ten Commandments given to Moosa (alayhi wa sallam). These are the principles that will help us rectify our deen and in dunya. So it’s incumbent upon us to understand and implement these points of advice, commandments from Surah Al-An’am in our lives. And that you be dutiful to your parents. If one or both of them attain old age in your life, say not to them a word of disrespect, nor shout at them but address them in terms of honor. And lower to them the wing of submission and humility through mercy, and say: “My Lord! Bestow upon them Your Mercy as they did bring me up when I was young.” Your Lord knows best what is in your inner-selves. If you are righteous, then, verily, He is Ever Most Forgiving to those who turn to Him again and again in obedience, and in repentance. And come not near to the orphan’s property except to improve it, until he attains the age of full strength.